Officials Probe E-Cigarettes' Health Claims Electronic cigarettes let smokers inhale a dose of nicotine and exhale "smoke" (it's water vapor). The products are marketed as a healthier, tobacco-free way to smoke, but that has raised a red flag with government regulators. 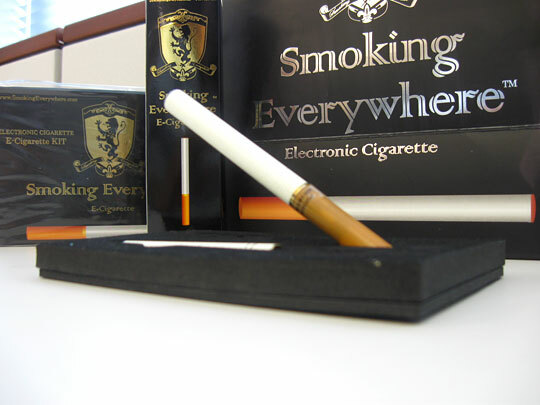 An electronic cigarette "starter kit" goes for $60. Entrepreneurs are always trying to come up with new products for smokers: a nicotine lollipop or a bottle of Nico Water to give you that fix when you can't light up. Those products didn't pass muster with the Food and Drug Administration. And now, the agency is taking a closer look at the latest trend: electronic cigarettes. At the smoke-free Tyson's Corner shopping mall in McLean, Va., Clarence Chatman puffs away on what appears to be a lit cigarette; little white clouds billow from his nostrils. "That's funny," Chatman says. "So even though smoke is coming out, you're not smoking." He's trying a Liberty electronic cigarette, a stainless steel tube with a battery that heats up a nicotine solution. Chatman takes a drag of the resulting vapor. "You have to pull on it real hard in order to get something out of it," he says. "And then you feel the nicotine when you're letting the smoke out." The "smoke" is actually just water vapor. "I could see getting in a lot of trouble: 'Hey! You can't smoke in here!'" Chatman says. "But it's not smoke." Chatman, a tourist from Rochester, N.Y., wants to quit after 35 years of smoking — a desire sparked by this month's 62-cent per pack increase in the federal cigarette tax. 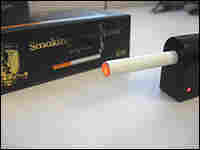 The budding electronic cigarette industry targets smokers like Chatman at kiosks in malls and on the Internet. E-cigarettes, as they are called, come in a variety of flavors: coffee, chocolate, mint, apple — and yes, tobacco. But they don't contain any tobacco. In an advertisement, the maker of one e-cigarette, Smoking Everywhere, claims, "Fact: Smoking Everywhere electronic cigarette is the healthier way to smoke." That claim raises a red flag for government regulators. "We're concerned about the potential for addiction to and abuse of these products," says FDA spokeswoman Rita Chappelle. "Some people may mistakenly perceive these products to be safer alternatives to conventional tobacco use." The agency has opened an investigation and has refused to allow e-cigarettes, e-cigars and e-pipes to cross the border because they're considered new drugs that require FDA approval. But the industry questions the FDA's jurisdiction. "Like a traditional cigarette, this product is not intended to produce a therapeutic effect," says Walt Linscott, legal counsel for Smoking Everywhere Inc. "It is not a drug, if you will. 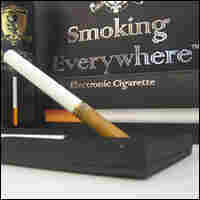 This is an adult smoking experience, and it should be thought of and regulated in that similar construct." The Supreme Court has ruled that the FDA does not have the authority to regulate tobacco. But a bill pending in Congress would give the agency that power and allow it to reduce nicotine levels. Linscott argues that e-cigarettes could be an effective bridge in that process. Anti-smoking advocates wonder whether that could be the case. "I think there's a lot of possibilities; it's intriguing," says Thomas Glynn with the American Cancer Society. "But it needs to go through some rigorous testing before the public health community would feel comfortable with it." Glynn says similar nicotine-only products haven't caught on, in part because smokers are so tied to the ritual of smoking. E-cigarettes could be different, Glynn says, if FDA-reviewed clinical studies show they are safe and effective. "Any product that we ingest, we'd like to see go through the Food and Drug Administration," Glynn says. "I mean, we know more, to be honest, about what's in dog food and macaroni and cheese than we know what's in tobacco in this country. And there's no reason to introduce yet another product where we don't know what we're ingesting." Back at the mall, Chatman says that for now, he won't spend $60 on an electronic cigarette starter kit. "I like the idea of no smoke, and you can puff it wherever you want to," he says. "But I don't know. I was trying to weigh the cost." It's unclear how much longer Chatman will have to weigh his options. The FDA's investigation is ongoing, and the agency is under pressure from public health advocates, including New Jersey Democrat Sen. Frank Lautenberg, to take electronic cigarettes off the market until they are proved to be safe.